Xenophone is an advanced analog mono-synth with 100% analog signal path. It has three oscillators, two subs, three ring modulators, one multimode VCF and analog distortion, all based on discrete analog circuits followed by a high quality stereo digital delay and reverb. The extensive modulation capabilities of the sound engine plus the warm and unique character of Xen's filter enriched by built-in analog distortion make it the best choice for creating deep basses, aggressive leads, transparent and crisp synth lines, acid sequences, complex arpeggios, punchy percussive sounds, extreme SFXs and more. Besides the synthesis capabilities, it can be used as a powerful audio processor to colorize an external input signal by analog filter, distortion and DFX. 26 encoders and 27 buttons put all the major parameters easily reachable with no menu diving. The Encoders smoothly turn and provide you 96 steps per rotation that mimic pot's feeling and sweep range. The layout is designed in a way to be simple and intuitive. Using 88 LEDs and a free-angle OLED display, it is easy to get the idea of the current preset at a glance. 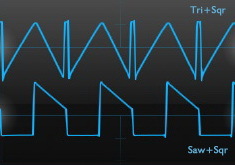 Master Tempo and all LFOs have blinking LEDs that show the BPM and rates. The presets can be previewed without external keyboard using 3 buttons in 3-octave range or pre-defined notes. User interface is easy to learn and creative with no useless bells and whistles. You can get a huge sound out of the box only with a few tweaks and changes. Xenophone has a rigid Aluminum enclosure that comes with a pair of vintage style hand-made wooden side panel that made out of maple wood in two options: flat and tilted. The box connects to the outside world using 2x balanced outputs (stereo), 1x headphone jack, 1x external input, 1x CV input, MIDI in/out, USB and DC power in. Xenophone can function as a standalone instrument or fully programmable synth. It responds to the standard MIDI messages plus dedicated CC and NRPNs. The maximum implemented resolution in NRPN mode is 12bit, 4096 steps for filter frequency that provides super smooth sweep over the frequency range in compare to 127 steps CC standard! 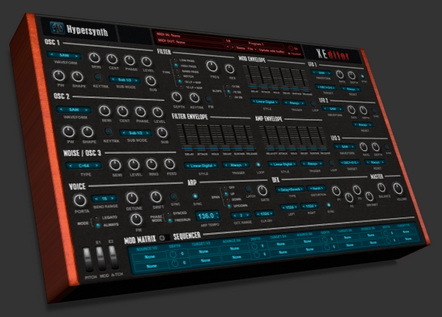 The computer integration is an important feature of a modern synth that plays vital role in the studio. Xenophone comes with a software editor called: XEditor. Using this editor you can control and automate every parameter of the sound engine remotely via MIDI and storing your patches on your PC and vise-versa. It also helps you in deep and precise editing the patches. 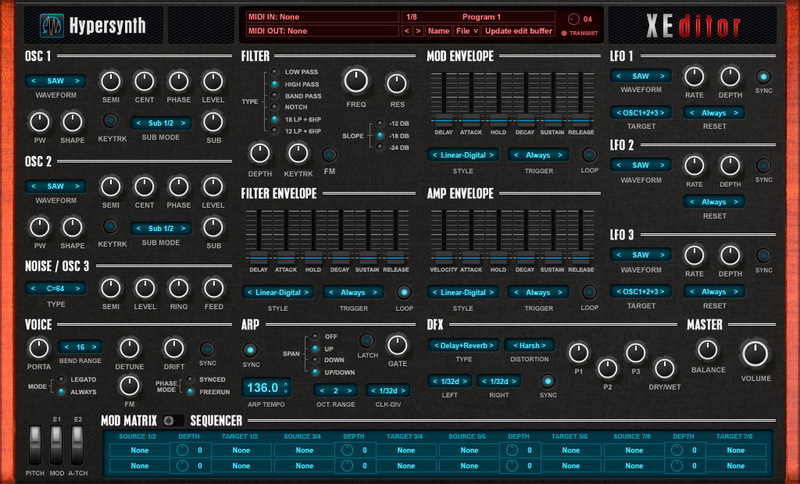 "XEditor" will be available as standalone and VST plug-in. In addition to the classic waveforms, Xenophone offers 2 new ones that are built from Tri+Sqr and Saw+Sqr. The combined waveform is not the summation of signals. It builds from a portion of first wave plus a portion of the second in each freq cycle which can be controlled with "shape" parameter. Using this technique new harmonics are added to the signal that makes the oscillator sounds different and unique regarding the shape and square PW value. Each oscillator has a dedicated sub oscillator, tunable 1 or 2 octave below that helps emphasizing bass freq deeply. X-Ring is XOR ring modulator between the square wav of oscillator and its sub (4 or 8 octave below) useful for creating crunchy and gritty sounds. Xor ring modulator is a kind of analog ring modulator that only receives square wave as input, the output is square wave and result of the input multiplication. It has been used in many vintage synths like Arp, Korg and etc. Ring modulation between oscillator 1 and 2 signals, with dedicated level control. You can get metallic and bell type sounds out of this modulator with analog flavor. Capable of generating White, Pink, Red and C64 pitched noise! 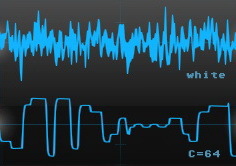 Pitched noise is a lofi-ish tunable noise and you can play it like an oscillator. 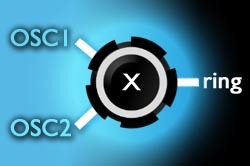 Xenophone VCF delivers ten types of filtering. Among the classic lowpass, highpass, bandpass, and notch in various slopes, It introduces 2 innovative filter type which are build from cascading a "18/12dB lowpass" and "6dB highpass" filter with custom feedback. The cascaded filters create amazing textures of screaming resonance at high end and growling low end that self-oscillate with "triangle wave" and "clipped triangle" instead of classic sinus wave in 24dB mode. Xenophone has 3 flexible DAHDSR envelopes (range=1mS to 30S). "Hold" stage specifically controls the punch to emphasis kicks and percussive sounds. Each envelope offers 4 styles: (Linear, RC, RC2, EXP). Linear sounds like a digital envelope while RC emulates an analog RC-based envelope. Besides the classic trigger options, Filter and Mod envelopes can be triggered via LFO2-S&H. Distortion section is pure analog and able to colorize the sound from subtle warmth to screaming distortion using 3 selectable modes: Light, Harsh and Massive. The feedback path from filter output to mixer input produces a kind of overdrive effect that is controlled by external-input level. Xenophone is equipped by a 24bit stereo effect processor. DFX delivers delay and reverb in various algorithms. 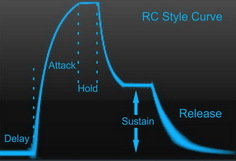 Delay time can be synced to tempo to produce rhythmic effects. Arpeggiator with 4 modes of arpeggiation, gate adjustment, 15 time divisions, latch button and indicator.